Original photo by mshipp. Modified by Rikki Endsley. CC BY-SA 2.0. Markdown is one of most popular document formats among developers and non-developers alike. It is easy to write and understand, but organizing Markdown docs is difficult. 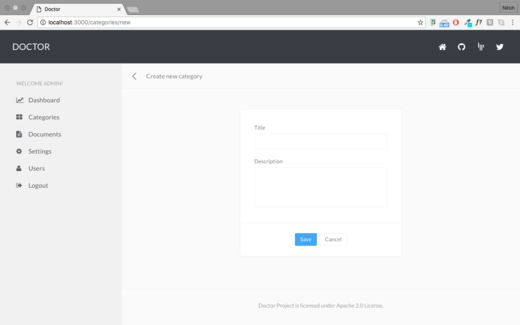 In this post I will introduce you to Doctor, a documentation server, that lets you manage your project's documentation with minimum effort. Think of Doctor as a content management system (CMS), but instead of a traditional database backend, it uses your Markdown documents as the backend. Simply add the path to your documents in the Doctor dashboard, and Doctor then serves these documents on the web. You can also use Doctor to aggregate multiple Markdown files from multiple repositories into a single documentation site. So, Doctor essentially decouples document context from document serving—irrespective of where your documents reside, on Google Drive, GitHub, Dropbox, ownCloud, or somewhere else, you can easily serve them via a website. Licensed under the Apache v2.0 license, Doctor was created by the team behind Minio, an object storage server. Minio uses Doctor to host their documentation. Check out this live Doctor demo. You can either install Doctor the traditional way, i.e. 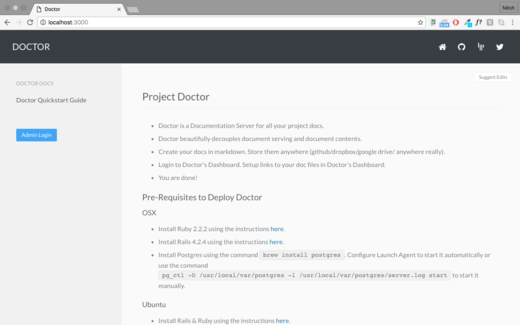 install the framework and database and then run Doctor, or you can use Docker to quickly launch a Doctor instance and see it in action. I will discuss both the steps here, starting with the traditional method. 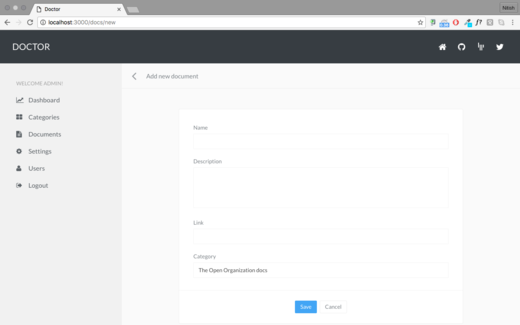 The Doctor dashboard lets you categorize, add, group, remove and publish documents. To start with, you need a category where you can add new documents. This gives a logical grouping to the documents. Once a category is added, it automatically appears when you add a new document. Note that you should enter the link to your raw Markdown file, or the page will not be rendered properly. You can see how the pages are neatly arranged under corresponding categories on the left. To customize Doctor pages, click on the Settings link. Here you can see the options to manage Project Settings, Social Links, and Appearance. 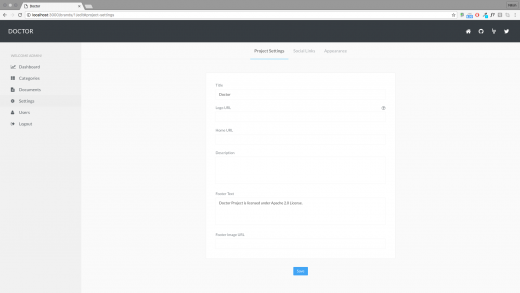 Project settings section lets you edit the title, logo, home URL, and description. You can add the social media links of your project via Social Links section. The Appearance tab lets you customize the color scheme, font family, and font size. Doctor also provides user management via dashboard. Click Users to add or remove users who can have access to the dashboard. If you need to manage documents written in Markdown format, it is very easy to get started with Doctor. 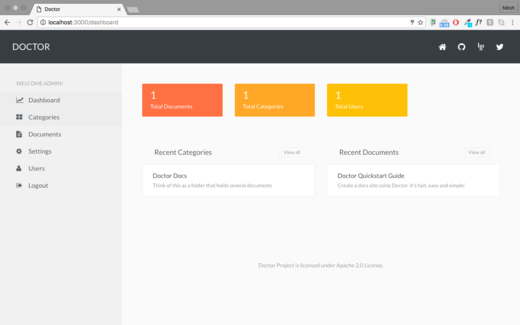 With Doctor you can manage and publish your Markdown documents on the Internet with minimal effort. Wow, this looks like a really awesome tool. Thanks for pointing to this handy tool. Just installed it successfully via Docker. This really looks very simple as you just put in URLs of raw documents hosted on GitHub or GitLab. No duplicate content, no new editors or interfaces. Quite cool. I just wished I could export a collection of documents for further processing with pandoc or Gitbook.